A sturdy format gives classic Tomie dePaola nursery rhymes and bedtime stories staying power. Tomie's Three Bears and Other Tales, adapted from Tomie dePaola's Favorite Nursery Tales, contains retellings aimed at youngest fans of the titular story as well as ""The Little Red Hen"" and ""The Three Little Pigs."" 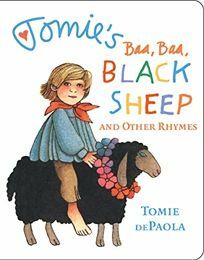 Fans may recognize the signature artwork in Tomie's Baa, Baa, Black Sheep and Other Rhymes, which features ""Jack and Jill,"" ""Little Miss Muffet"" and ""Hey, Diddle Diddle"" along with the title rhyme. .